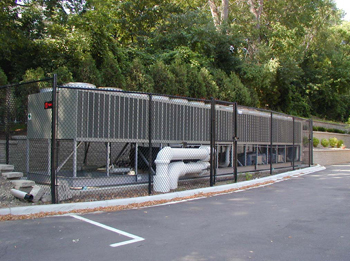 A 400-ton, air cooled, rotary compressor, chiller was installed at a private school to service their new expansion. A location had been chosen to minimize noise impact on residential neighbors (Class 1 Land Use) and the school itself. However, intrinsic site topography aggravated chiller noise emissions, which exceeded the local noise ordinance, resulting in legal action. 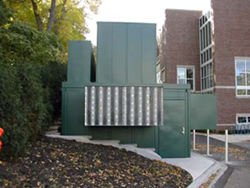 Prior to ASI Aeroacoustics involvement, a number of remediation schemes were considered including chiller relocation. 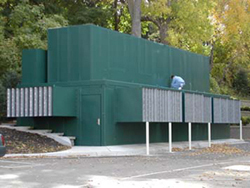 A cantilevered acoustic barrier system was designed and estimated at well over $500,000 to fabricate and install! Due to the questionable acoustic and aerodynamic performance projected by the cantilevered barrier, ASI Aeroacoustics was brought into the remediation project. Within two weeks time, ASI Aeroacoustics had developed conceptual designs for a totally passive (no booster fans, no blowers) acoustic enclosure, accomplished aeroacoustic computer simulations including defacto site topography with all computer modeling under full thermal load and aerodynamic flow of nearly 270,000-SCFM of air. From the iterative computer simulation, a design configuration was selected that would guarantee the owner a minimum noise reduction of 30 dBA at 1 meter distance away from any silencer intake or discharge, all at far less cost than the acoustic barrier. ASI Aeroacoustics provided the system design, acoustic hardware fabrication, installation supervision and performance warranty for acoustics as well as chiller operating parameters. Actual installation was accomplished by the owner's building contractor. The contractor had estimated a nominal five days on site for installation. Actual installation was accomplishe in just 5 hours attributable to ASI Aeroacoustic's modular construction and precision fit up. System acoustic performance (dynamic insertion loss or noise reduction) was tested at approximately 40 dBA at 1 meter distance from the chiller enclosure. Increased power consumption and reduced cooling capacity was immeasurable. ASI Aeroacoustics's aerodynamic design allows the addition of intake filters to reduce condenser coil fouling and subsequent maintenance. 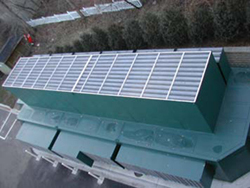 Reduced solar heat gain on chiller is expected to offset any losses attributable to minimal, aerodynamic static pressure.